4 out of 5 for the scanner. Pros: - Quick, well built, comes with all possible cables. Nice little unit. Con: - Software interface could be easier/nicer for the end user. We now have 5 Kodak i30 scanners in use at our company, all purchased from yourselves. They integrate well with our Document Management software and are rarely out of action. Easy to set up and use I would give them a 5 star rating. The competitive pricing of the scanner made it an easy purchase choice. 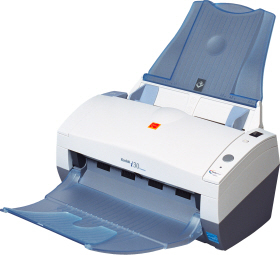 If you need a reliable, small desktop scanner the Kodak i30 is ideal. It is simple to use and fast and as most business corresponence is single sided you benefit from not having to have a flatbed taking up excessive space. The scanner is excellent, works well, very fast, easy to install. With regards to the software the character recognition could be better but overall I would give the scanner 4/5. The scanner is fine, I had some problems setting it up, but it is working OK now. The software that came with the machine does not seen do the work how I want it done, but to be fair I have not really had the time to sit down and study it fully. For integrators, bundled ISIS and Kodak-developed TWAIN drivers deliver speedy system integration. For end-users, the exclusive, Kodak-developed TWAIN drivers enable Kodak's advanced image processing at the Kodak i30 document management scanner's full rated speed.